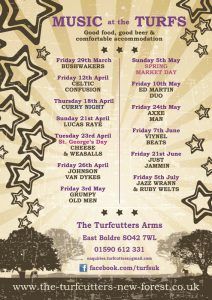 Great line up confirmed for lots of Friday evenings and Sunday afternoons this spring and summer, see our events calendar for more details. We are looking for more stalls for our popular annual early May Bank Holiday Weekend Market Day on Sunday 5 May. Anyone wishing to come along and sell your wares there’s no charge for a pitch so if you have art, crafts, cards, local produce to sell (and a table to put them on!) bring them along and join the fun with live music, bbq and of course beer! Also this coming Tuesday it’s St George’s Day (23 April in case you’d forgotten the date) we’ll be serving a traditional menu, and Cheese and Weasalls will be playing some good old English music to accompany your dining. So do come along and join us! For great pub food and a warm New Forest welcome, come along to the Turfcutters Arms. A traditional pub with bed & breakfast accommodation available in our converted thatched barn. In the New Forest, about 3 miles south of Beaulieu, our pub is situated in the village of East Boldre. 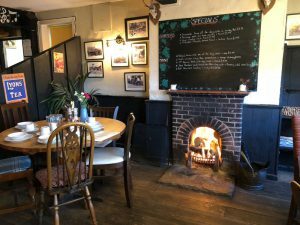 More than just a pub with rooms, we are one of the few remaining traditional New Forest pubs in Hampshire and are quite famous locally for serving up some of the most outstanding food in the area at very reasonable prices. We have roaring open fires in the winter, and a lovely pub garden for the summer. We’re only a short drive from Southampton or Bournemouth, so whether you have spent the day sampling the delights of the cities or you’ve been walking, or cycling, through the beautiful countryside of the New Forest, it makes an ideal place to stop off for refreshments. If you’re attending a function at hotels nearby such as The Montagu Arms Hotel in Beaulieu or The Master Builder’s Hotel in Buckler’s Hard, do give us a call to see if we can sort something out for you. We welcome dogs and well-behaved children and a warm reception is extended to everyone. Feel free to contact us, get directions or check out our rooms. From Mr Whippy to Rum n Coke Float!